We all watch the movies and see Navy SEALs and other Special Forces soldiers armed to the teeth with assault rifles and ammo. But ask any of these elite warriors about the most important tool they carry into the field and the answer is the same, their knife. 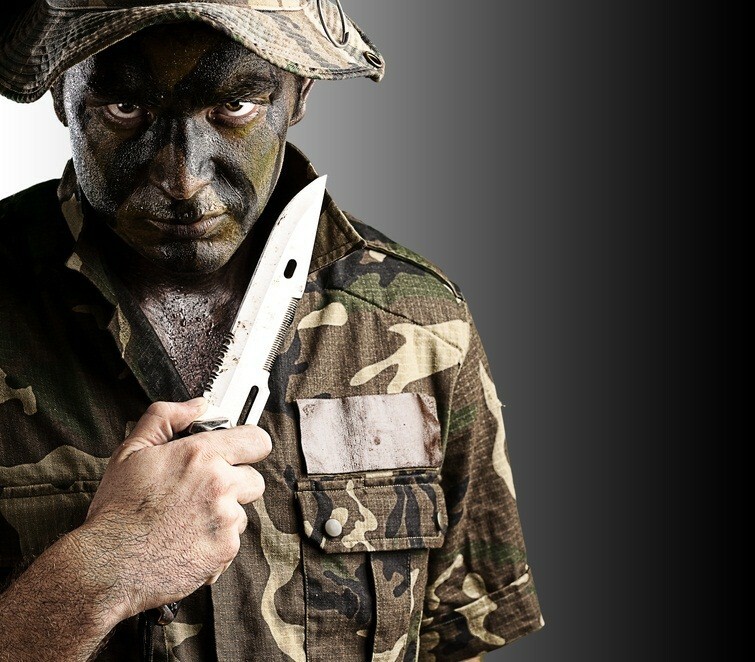 Military survival knives are often the difference makers in emergency situations, both in combat and civilian situations. Not all knives are created equal, and military-grade knives are usually in the top of their class when it comes to survival. A good survival knife should be full-tanged and lightweight with a strong, easy to grip handle. The blade should be made of quality steel that keeps its edge and stands up to tough use and weather damage. The choice of what knife to carry in the wilderness is highly personal, and one man’s Excalibur is another man’s junk blade. Below we will take a look at what we consider the top 3 military survival knives currently available and what sets them apart from their competitors. The KA-BAR Full-Size Straight Edge knife has been a workhorse blade for American troops since World War II–and for good reason. Made in the USA and stamped with the USMC mark, the knife features a 7-inch straight edge blade made of 10-95 Cro-van steel that undergoes a strict inspection for corrosion resistance, strength, and ability to hold its razor-sharp edge. Though also available in a partially serrated blade, the straight edge is dead simple to sharpen and is perfect for carving, gutting, and any camp chore. The full length of the knife measures in at a lengthy 11 7/8-inches and features an oval-shaped compressed leather handle topped with a generous finger guard to prevent slip-ups. The KA-BAR Full-Size weighs just 10.4 ounces and is exceptionally well balanced. The included leather sheath is durable and keeps the knife secured and the blade protected. While other more stylish, tactical-looking knives are available, few will give you a lifetime of survival potential at such a bargain like the KA-BAR. You don’t have to be a Marine to appreciate the knife that has been gotten soldiers out of jams in the Korean War, Afghanistan, and every conflict in between. US Navy SEALs undergo some of the most rigorous warrior-training programs ever devised. So it only makes sense that the knives they carry are held to equal standards. The SOG SEAL Team Elite knife was put through a demanding evaluation to test: tip breaking, blade breaking, sharpness, edge retention, salt water immersion, fire resistance, chopping, hammering, and several other factors in order to create the most durable possible military survival knife. Everything about the SOG SEAL Team Elite is designed to stand up to extreme abuse without missing a cut. The blade is 7-inches of TiNi coated AUS8 stainless steel with a partially serrated edge and rasped spine for notching. The handle is made of a rugged Zytel with an extended tang that acts as a glass-breaker and multipurpose hammer. The sheath included with the knife is one of the highest quality on the market. It’s made of riveted, double-stitched nylon with an accessory pouch and MOLLE-compatible loops. Fans wanting a smaller and less expensive blade may consider the SOG SEAL Pup, an equally efficient survival knife. And though its bit pricier than the KA-BAR, the SOG SEAL Team Elite is arguably a stronger and more dynamic cutting tool. The LMF II Infantry Knife is quickly becoming one of the most popular short blade military survival knives available to the public. Gerber has been making outdoor tools since the 1930s and their survival knives only keep getting better, as seen in the LMF II. With an overall length of 10 1/2-inches, the drop point blade measures a mere 4.84-inches long and is made of 420HC stainless steel with a partially serrated edge. This is a quality steel that is resistant to rust and incredibly tough for all your cutting, slicing, chopping, and prying needs. The Gerber LMF II is the only survival knife mentioned here that is not full tang. Instead, the handle is a glass-filled nylon wrapped in a comfy TPV rubber skin. The handle serves to reduce fatigue and absorb electrical shock and the skin is much easier to grip than SOG-type handles, even when wet. That’s because the LMF was designed as an aircrew survival knife that could stand up to cutting through live wires in a damaged aircraft. The knife weights only 11.67 ounces, a weight that doubles when combined with the multipurpose sheath. The sheath is made of a fire-retardant ballistic nylon that holds the blade in place with a friction lock system for left or right-handed carry. Built into the sheath is a V-type blade sharpener, MOLLE compatible loops, and comfortable straps for leg or thigh carrying. If that fact–and the fact that troops have been field-testing the LMF II for a few years now–doesn’t sell you on the knife’s strength, you probably can’t be sold. Gerber backs the knife with a Lifetime Warranty for all the skeptics out there. Either way, the LMF II is an innovative and versatile tool that will serve downed pilots and disaster preppers with equal function. These are only 3 of what can be considered the best and most popular military survival knives on the market. Many less-expensive options are available, but your knife is one of the most important tools you carry into the wild and should be a well-thought out investment. You never know when your knife will save your life, so make sure you pick the best one for you. Have you read our guide to the best survival knives or the survival bowie knife?